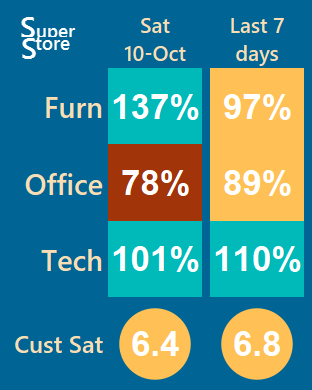 Gotta say I’m getting excited about heading to Las Vegas next week for the Tableau Customer Conference. Excited to see so many other folks are getting excited – and even excited enough to dust off my Blog and put something out there to share. It was a really big fun challenge, and we ended up creating something pretty cool. The viz hasn’t quite made it’s way to the MD’s wrist (Where) via a subscription email yet – but we’re confident it’s going to be a big hit. So what made it big challenge? – I’m glad you asked…. As for the When: for a daily delivered email to gain attention, we really needed to focus on a short time period. (Remember we’re talking Sales Folks attention spans here). Something that would be different every day was a must, so “How did we go Yesterday?” was an obvious go-to lure, closely followed by “How did we go in the last 7 days?” A bit of longer term trending would also be nice. “Am I going to get my Quarterly bonus?” I’m sure is a question that Sales Execs never stop asking. The How was the biggest challenge with an apple watch specific viz. Firstly was the ‘no interaction‘ rule. The execs were going to get this purely in an email picture – which of course can’t be launched into a interactive version within a browser with a touch of the finger. This means no tooltips, no filters, no parameter controls – so any labels and headers had to be readable without interaction. Secondly the size. 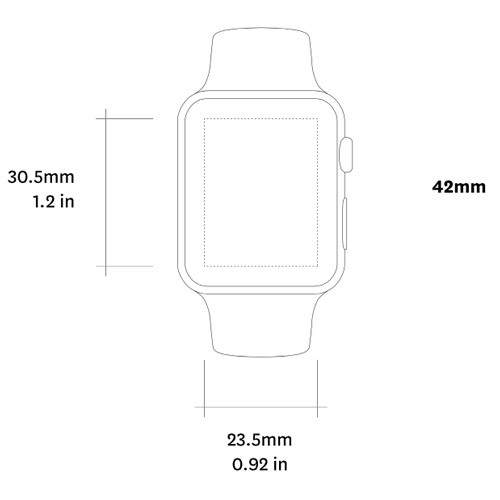 Even with the larger model, the 42mm, (which is the diagonal measurement) is about 24mm x 30mm – (or 0.92in x 1.2in for you imperialists out there). In pixels you are talking only 312w x 390h. When I first ‘exactly”d up the empty dashboard and started experimenting with some test views, it didn’t look too bad on my HD laptop screen. I went big with fonts and labels – but turned out nowhere near big enough. Our first publish and subscribe showed the charts pretty small and the numbers not quite readable. I was interested to recently read about @cheeky_chappy‘s experience in being able to interpret a teeny version of a viz you already knew well at full size, simply by colouring and present/not present bars; but in our case we needed at-a-glance understanding from someone who’d never seen the viz before. In the end, what worked best as the primary viz was a simple 2 x column, 6 row grid of text numbers,coloured with my clients version of RAG; suitably acronymed POT (Purple Orange Teal) i.e. a heat map. Even two columns of big numbers took up a big chunk of my 312px, therefore to keep our headers readable we abbreviated big-time, (the five character product was an extragavance). That left enough room for some branding with a logo (yes – the usual logo header on Tableau Server would not be there on an email – so we had go squeeze it in there somewhere). We also put together some secondary Dashboards for each product showing sparkline type trending over a longer time period. Big fat labels on these viz’s were much more of a challenge – but I’ll leave that to a separate post. I’d love to show it off to you all…..but…..the tragedy of being a tableau consultant is that most of my creations remain locked behind the firewall, only able to be enjoyed by a lucky select audience. So……. Once I was happy, I uploaded it to Tableau Online (thanks MIP) – and set myself up a daily subscription, and let it rip. 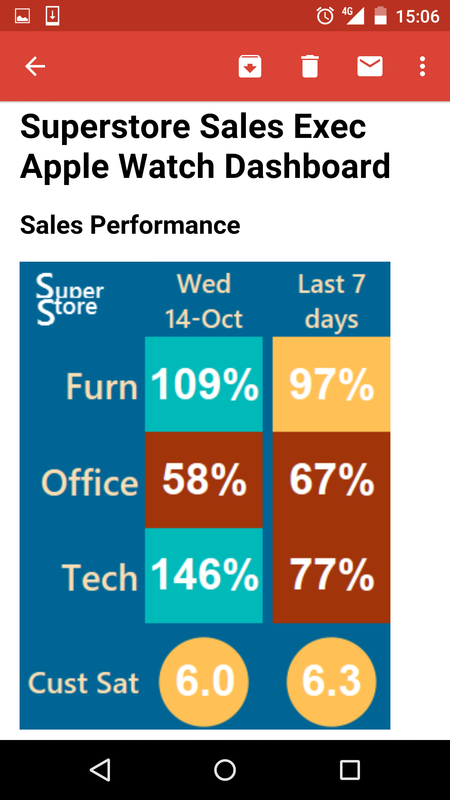 Stay tuned for the Part 2 post on the sub-story of the secondary apple watch friendly dashboards using Sparkline trending of each product and a whole lot of labelling / reference line trickery – including a link to the tableau public ‘interactive’ and downloadable version. This is great and the next step where I will go to, any chance you can send the work book for superstores and I can use as part of my demo and give you guys a name check during my session?